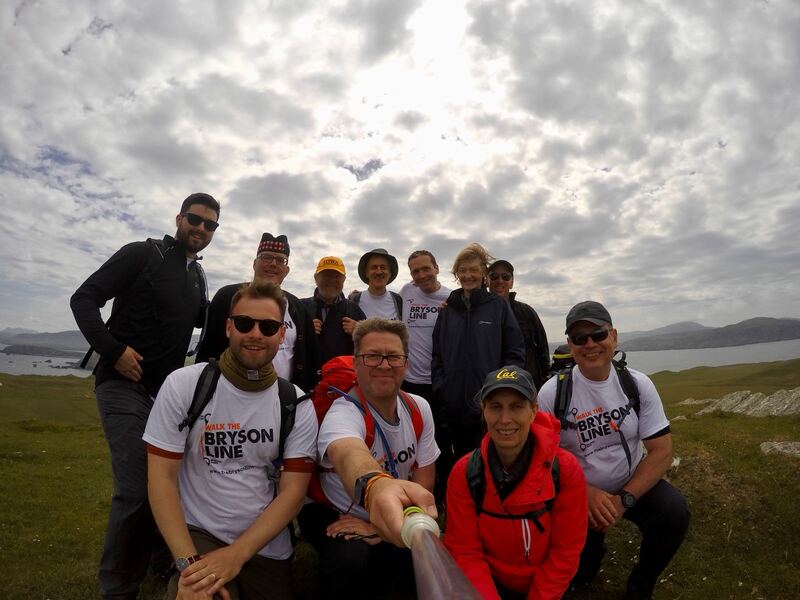 Bill Bryson today returned to Cape Wrath for the first time since he visited to research his book “The Road to Little Dribbling”. As this was the first day of our 30 day walk from Cape Wrath to Bognor Regis we were understandably nervous that the weather was good enough for the ferry to operate across the Kyle of Durness. We were fortunate to have been in touch with James Mather of Visit Cape Wrath ahead of our visit. James had arranged a special, early unscheduled trip with the ferryman at 7 am and ensured that one of his drivers, Stewart, was on hand to drive us to Cape Wrath. As it turns out, the weather played ball and at 7 am we found ourselves gliding across the Kyle at high tide to our rendezvous with the minibus. Another hour later and we were at the Cape Wrath lighthouse. Too early for a cup of tea at the infamous Ozone cafe, so off we went, with Bill leading the charge. Turns out, when he first visited he drove back so was thrilled to have the chance to walk the 11.5 miles back to the ferry. Cape Wrath is a live fire zone for the MOD and we were told to keep to the road. Fortunately there were no wrong turns to take and we made good time reaching the ferry slipway at lunchtime. Once back on the right side of the Kyle we decided to deviate from our original plan to get some miles under our belt walking south on the A838 and instead drove back to Durness to complete a 4.4 mile walk around Faraid Head, which contained perhaps the most beautiful beach I have ever seen. 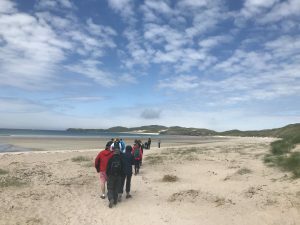 The weather improved (sun cream was required) and we enjoyed a wonderful walk up to an old MOD site and back via sand dunes and crisp white beaches. Take a look at this for a better idea.